Scotland might be a nation known for its rich history in the maritime industry, but the Cutty Sark is especially legendary. Built on the famous River Clyde in 1869, it was the work of top craftsman of the era. 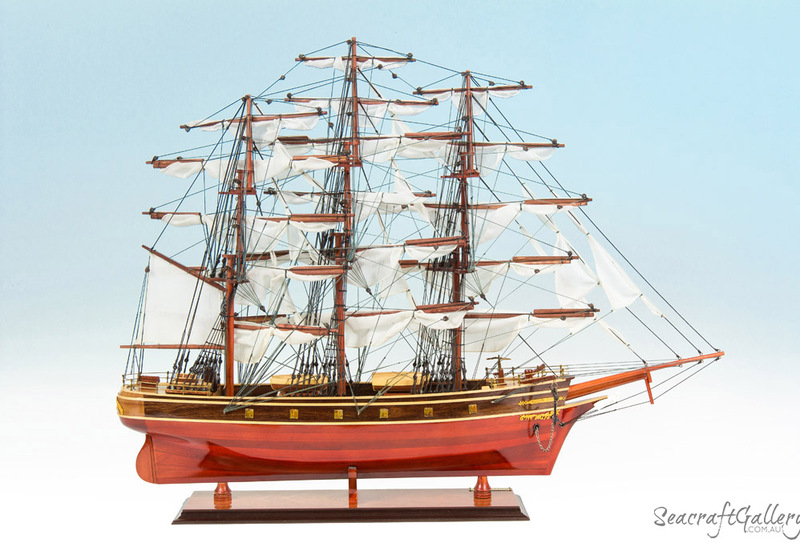 It served as one of the fastest ships not powered by steam on the market and served as one of the quickest tea clippers ever built. Indeed, she held the record time for a British transport for a decade. 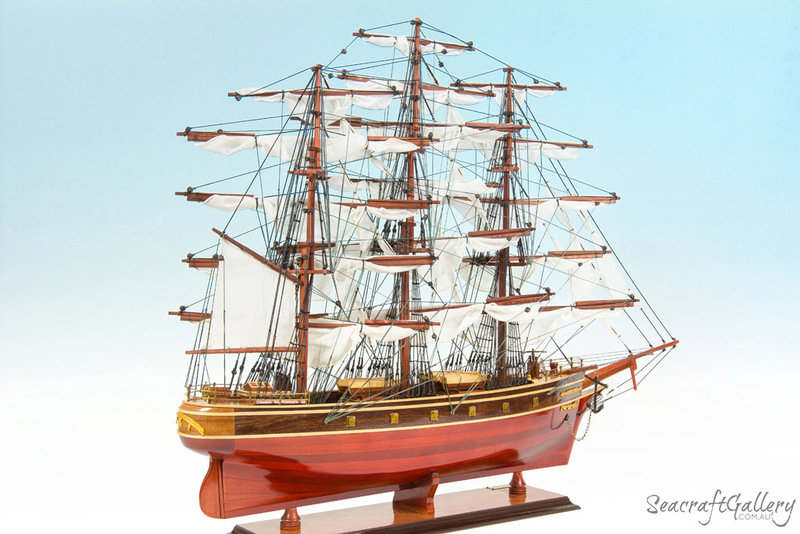 The Cutty Sark is a rich naval ship that comes with an immense history and performance. 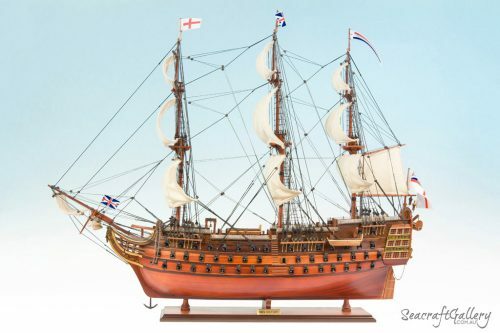 If you are serious about enjoying a more history-driven form of furniture, this ship replica is an ideal choice for collectors and lovers of history alike. 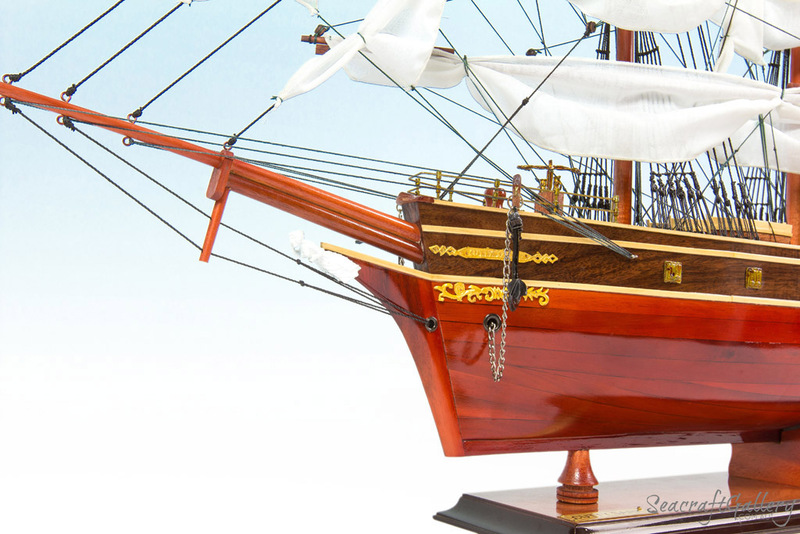 At 1:76 scale, this ship model delivers the history and strength of the Cutty Sark right into your home. 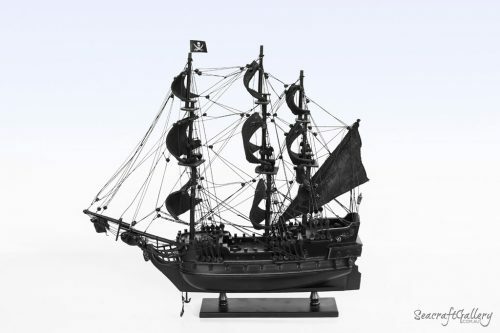 Made using as much detail and planning as possible, given the history of the ship. 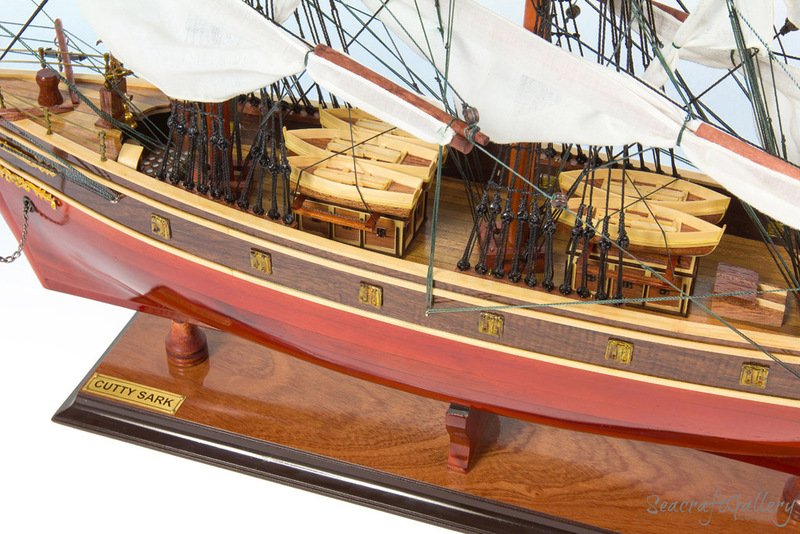 Not a kit – this fully hand-built wooden model ship arrived ready to be displayed on arrival. Made using high quality woods and metals to help ensure every piece feels authentic. 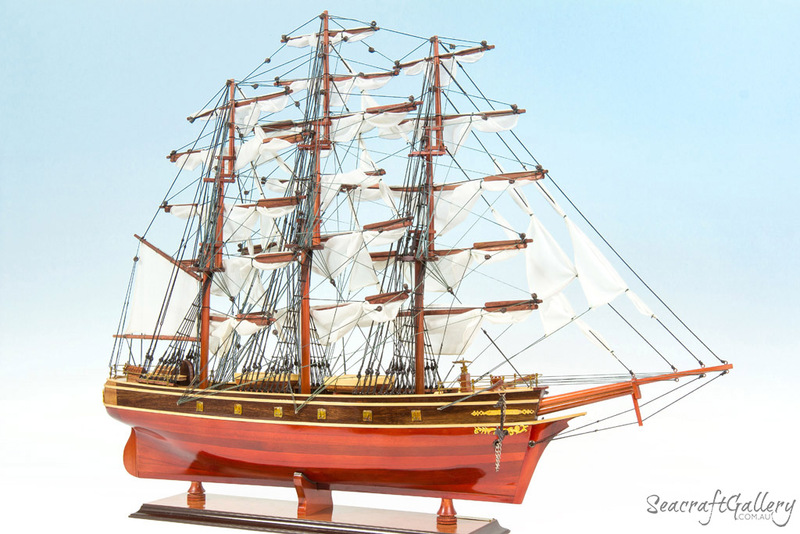 The model ship is designed to handle changes and adjustments in the climate too. Sails are made using handmade fine linen and also various textures used for rigging lines. Arrived on a sturdy and strong solid wooden base, complete with a metal name plate. Laminated sheet included that comes with the history of your ship model, also. 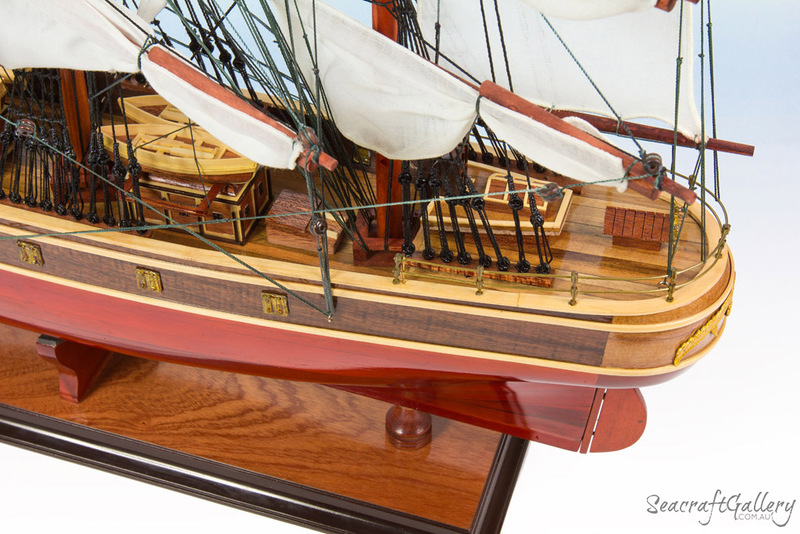 A perfect way to display your Cutty Sark model ship with a hardwood & perspex display case specially designed for tall ship models. 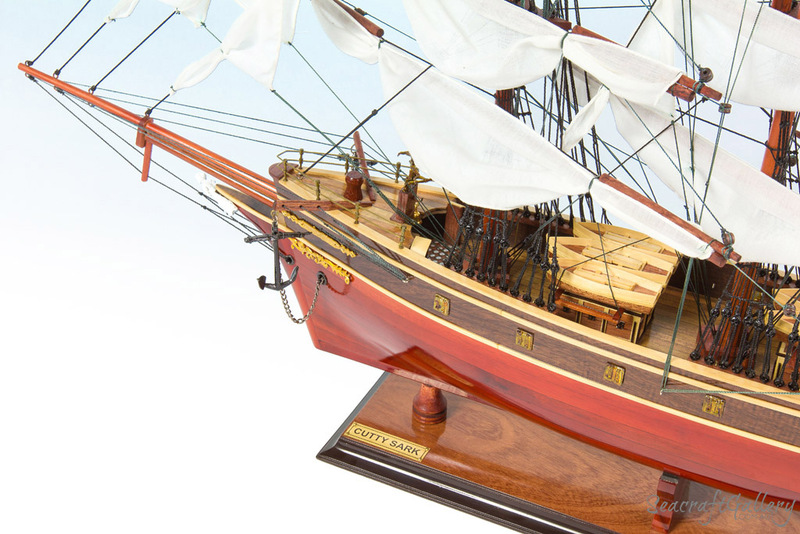 As the name implies, the Cutty Sark is a ship with a very interesting history. Though it was made to design and improve trade routes across the sea, her journey is very interesting indeed. 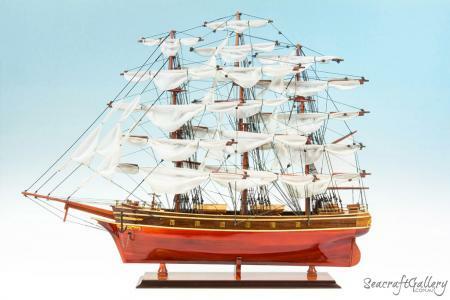 First designed in 1869, the ship was put together by Hercules Linton. She was a major part of Scottish shipbuilding and was designed for Captain John Willis. 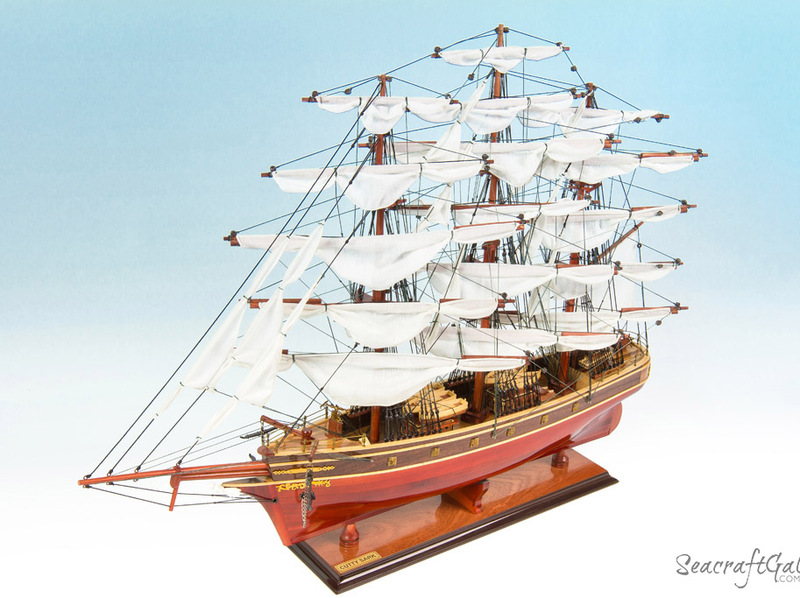 The Cutty Sark was a major trade model and was very fast despite her incredible size. Indeed, she used to race with other ships to make sure that she could reach China and get her tea delivered first. Also, the Cutty Sark managed to get into rapid races with the likes of Thermopylae, doing so in 1872. 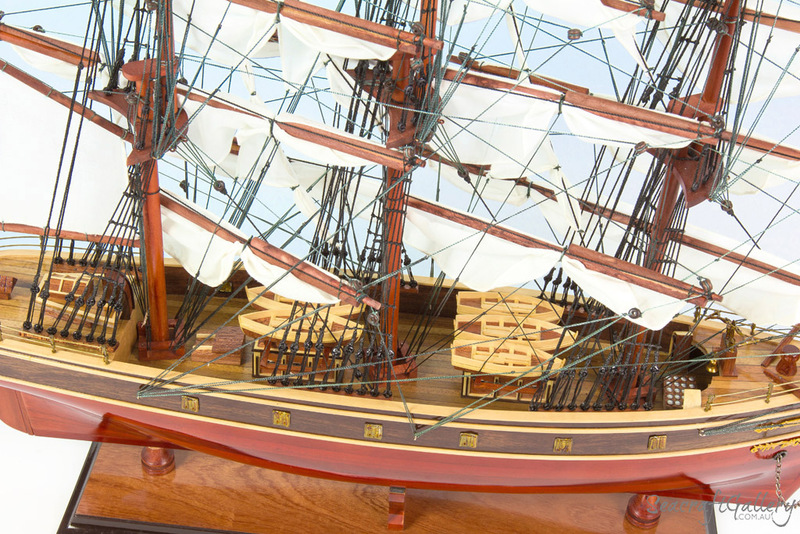 The two ships left Shanghai together, on June 18th 1872, but the Cutty Sark ran into trouble. She arrived in London a week after its competitor, after losing her rudder when passing through the Sunda Strait. Despite this, she was only a week short of her needed time – despite navigating the ship with a rudder of questionable quality. Even more impressively, she even managed to run from Australia to Britain in just over 67 days. It was, despite her size, a ship of incredible speed, reaching speeds as high as 666km in a single day. The ship was eventually renamed the Ferreira, after she was sold to the Portuguese firm of the same name. She was dismasted, sold and then re-rigged in 1916, and was renamed again; this time the Maria do Amparo. She was restored to originality by Captain Wilfred Dowman who used the ship as a training ship. The Cutty Sark was eventually moved to Greenwich, where she resides in a bespoke dry dock, in 1954. It’s now a major part of the naval display down there, still many people to look at one of the last truly great tea clippers. 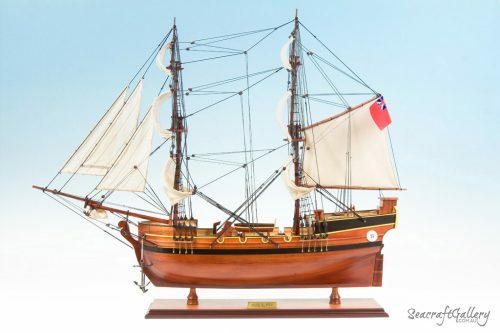 Beautiful ship looks good in my lounge room and thanks for the speedy delivery. Great service and beautiful boat! Was happy with the whole experience! The package arrived without any issues and we are thrilled with it. 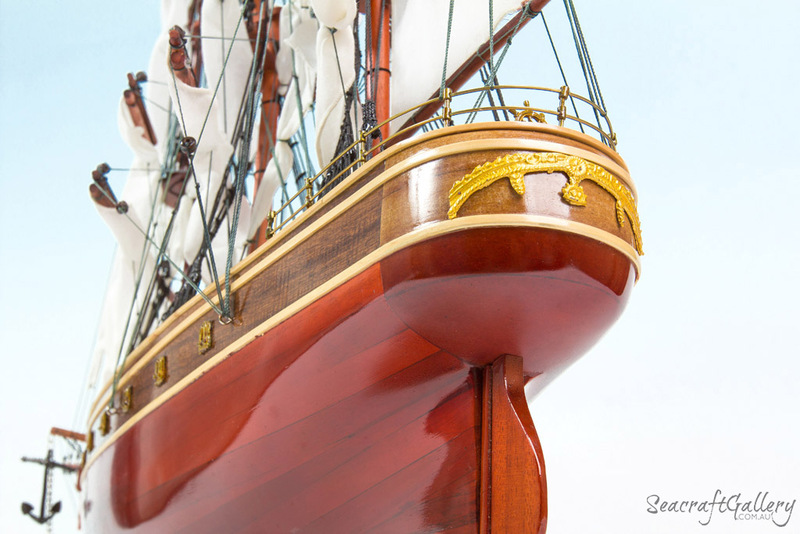 Great workmanship and detail! Keep up the good work. After wanting a model of the Cutty Sark all my life and having had previous unpleasant experiences trying to commission or find something that came up to my exacting standards, I discovered Seacraft Gallery. The model arrived at my home in SE Victoria in 3 days, carefully packaged and in top condition. It is so beautiful it literally brought a tear to my eye. The detail and workmanship are exquisite. 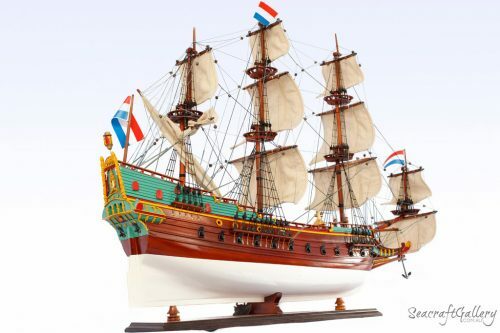 I don’t know how they can possibly sell and ship such craftsmanship for the price, as I would have gladly paid three times as much for a model of this quality. Five stars seems hopelessly inadequate for the standard of product and the prompt, efficient and courteous service Seacraft Gallery provides. You will never do better anywhere else (believe me, I’ve tried! ).